Photo file utility FNC renames your digital pictures based on the timestamp they were taken, plus a custom name (like an event description). 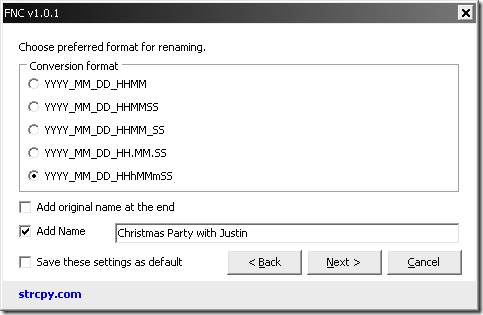 Point FNC at a directory of photos, and it reads the EXIF metadata your digital camera stores with the photos, and renames the files from your camera's default IMG_0002.JPG to the date in a format you choose, like 2009_08_21 Christmas Party with Justin.jpg. Very handy, especially for processing huge batches of photos from vacation or the holidays. FNC is a free download (donations welcome) for Windows only.